Candyland is a great board game for kindergarteners. The options are seemingly unlimited when searching for board games good for kindergarten age kids. Board game manufacturers cater to kids in the four to six age range by offering activities that are not only fun, but also teach youngsters important life lessons. Board games are amazing learning tools for kindergartners. In addition to teaching kids about patience and good sportsmanship, board games also help kindergartners improve their reading, spelling, math, memory and spatial skills. Kindegarten-friendly board games also promote confidence and show youngsters that learning can be fun. In fact, most kindergartners have so much fun playing board games, most don't realize that they are learning critical lessons in the process. Innovative board games good for kindergarten students create a stimulating and challenging environment for young children and foster of love of playing and learning. Candy Land has been delighting kindergarten age kids for more than 50 years. The color-themed game requires no reading skills, which is why it is often used as a child's first introduction to board games. The rules are simple--Players move their primary-colored gingerbread people along a rainbow path by matching the color spaces to the colors on their selected game cards. The player who reaches the Candy Castle first wins. In the original game, the magical journey through Candy Land features encounters with Mr. Mint, Lolly, and Queen Frostine. However, in the 1990s the game expanded to include other characters. 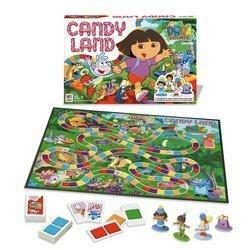 You can now purchase different versions of Candy Land, including Dora the Explorer Candy Land. The object of the game remains the same, though the classic characters are replaced by miniature Dora, Boots, Backpack and Diego playing pieces. Candy Land is suitable for two to four players ages three and up. The game promotes counting, color recognition, patience, good sportsmanship, and thinking skills. Also, by playing the game with others, children learn important social skills. Chutes and Ladders is another classic board game ideal for kindergarten age kids. The climbing and sliding game has been around since the 1940s, teaching kids about counting and number recognition. The simple game is easy to play, even for children who can't read. Fun pictures, character game pieces and a spinner are used during game play. The person who gets his child-shaped playing piece from square one to square 100 first is the winner. The board game features a slew of chutes and ladders that can help or hinder players on the road to 100. Land on a good deed space, and a ladder will race you ahead, but land on a chute and you will be sent back down to a smaller number. Chutes and Ladders is recommended for two to four players ages three and up. Trouble is an easy-to-play board game that promotes math skills using a race-and-chase set-up. The object of the game is simple--Be the first player to get your four game pieces all the way around the board, and you win. Players move their pieces after they press down on the game's signature pop-o-matic dice roller. The pop-o-matic dice roller is a dome-shaped clear plastic house that sits in the center of the board game and automatically rolls the dice when it's pressed down and released. Rolls of the dice determine the number of spaces you move. The "trouble" comes in when an opponent's piece lands on a space occupied by your piece. When that happens your piece gets sent back to the beginning. The simple board game requires no reading or strategizing and is recommended for two to four players ages five to nine years old. Sorry is often considered the king of children's board games. The classic chase game has been around since 1934, yet still remains popular with kindergarten kids. The game has a simple premise--Get your four pawns from Start to Home first and you win. The concept is easy, but the game is not without challenges. Your fate is left up to a deck of cards. By drawing cards, players move their game pieces around the board; however, you never know what the next card will hold. You could get lucky and slide ahead or your opponent could draw a card and send your game piece back to start.Sorry is recommended for two to four players ages five and up. If your child is sensitive or a poor loser, then Sorry might be frustrating for him to play. Youngsters who crumble easily may find it challenging to deal with having their game pieces sent back to start. However, the more your child plays Sorry the better he will get at strategizing and plotting his own revenge on fellow players.